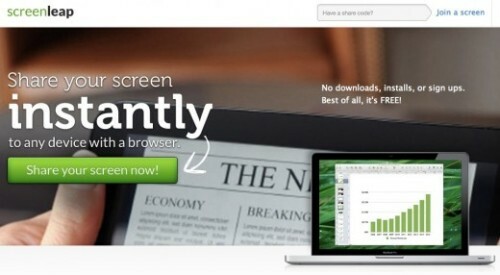 Screenleap is a website that allows users to instantly share your screen with anyone for free. Screenleap requires the latest version of Java to run. The way this screen sharing service is different from others is that you can share your screen on tablets and mobile phones as well. Other than Java, there is no software needed to run the service and you can share your screen with as many people as you need. I tested this out on my phone and was amazed at the speed that the movement translated from my laptop to my phone. Not sure if distance would make a difference, but the possibilities would be pretty intriguing for districts using Smartphones/iPods/iPads in their classrooms. The software allows users to share the entire screen or just a section. You can also pause sharing the screen whenever you feel necessary. When you share the screen it provides a generic URL or a code that can be entered on Screenleap.